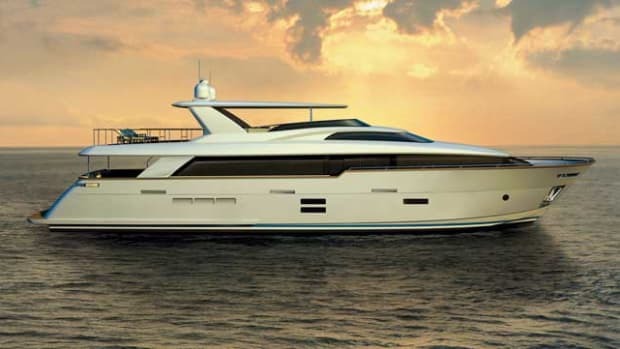 The Hatteras M90 Panacera is a different kind of entry-level superyacht. 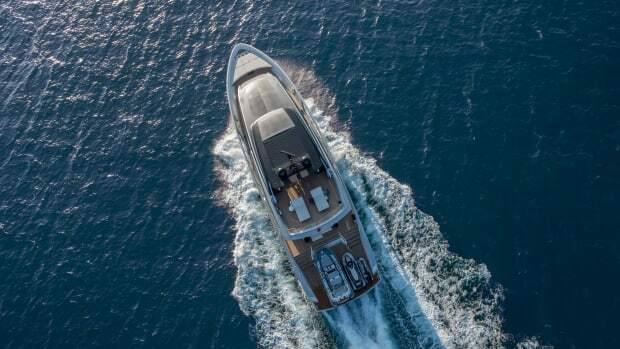 If you’re seeking a yacht in the 90- to 100-foot size range, you’ve probably noticed that most are a lot like their smaller sisters. Outside of devoting more floor space to the salon, staterooms and other guest areas, the general arrangements are essentially the same. Even headroom from builder to builder is generally equal. Most customers in this semi-custom market don’t mind, but there’s still room, literally and figuratively, for something different. 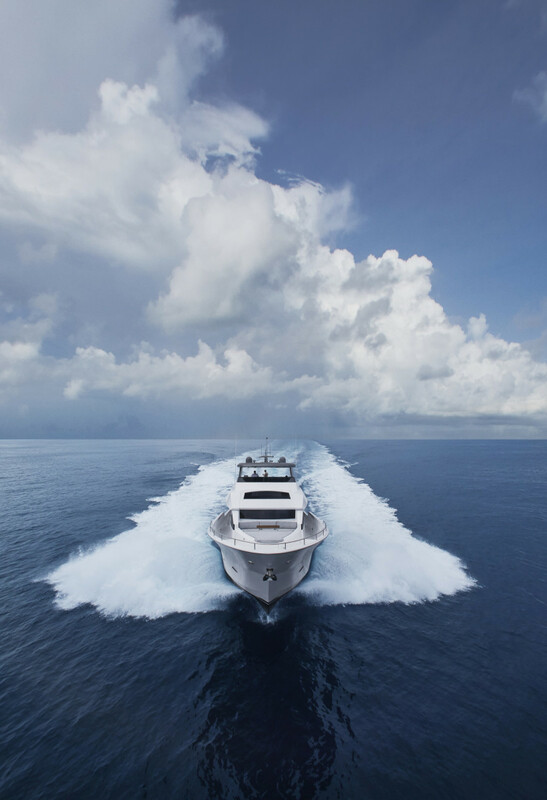 Hatteras’ newest Motor Yacht, the M90 Panacera, proves it. In fact, the differences don’t just benefit owners and guests. 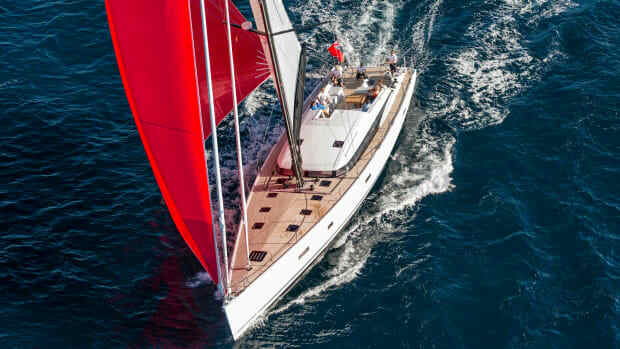 They aid the captain and crew, too, in unusual ways for a vessel of her 91-foot, 9-inch (27.9-meter) length overall. Arguably the biggest difference between the M90 Panacera and her competitors is the country kitchen. This quintessentially American arrangement will please owners who have a more relaxed relationship with their chef, and who relish a midnight snack without needing a stewardess. The space is all the more pleasing—for guests and crew—thanks to an atrium effect and three skylights. 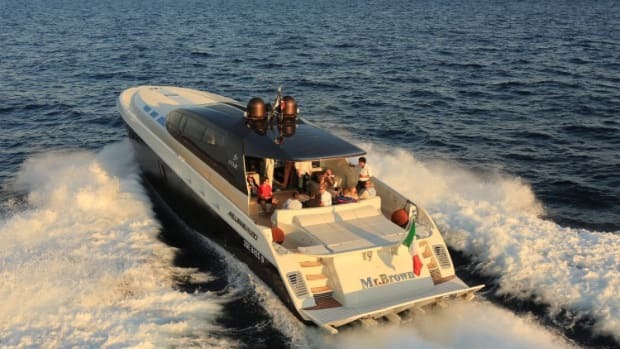 The Hatteras M75 Panacera (formerly called the 75 Motor Yacht) had the original version of these design elements, but on the M90, photos and words can’t quite convey the sense of volume they lend. 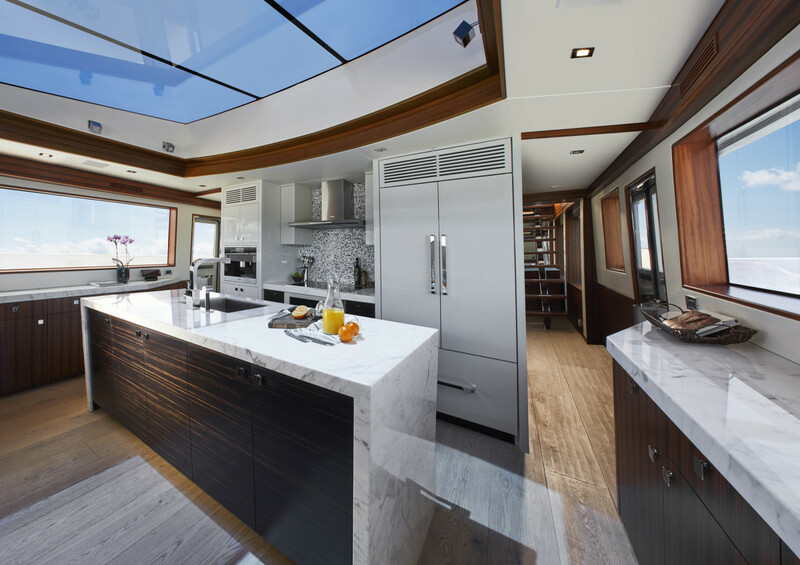 In combination with ports to three sides and predominantly white stone on hull number one, a spec build, these galley features create about as much light as there could possibly be. 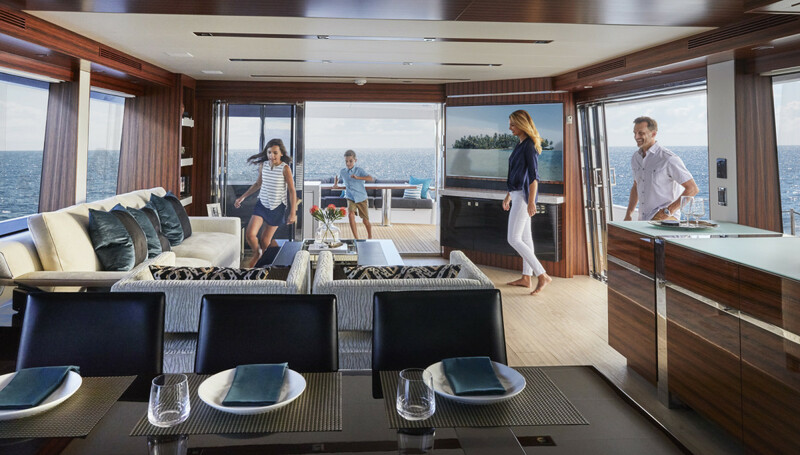 Hatteras opted to enhance the galley at the expense of adding a main-deck master stateroom, a layout that more and more builders in the 90- to 100-foot range are borrowing from larger yachts. However, the M90’s master still spans the full beam, suffering no lack of space from sharing the lower deck with three guest staterooms. 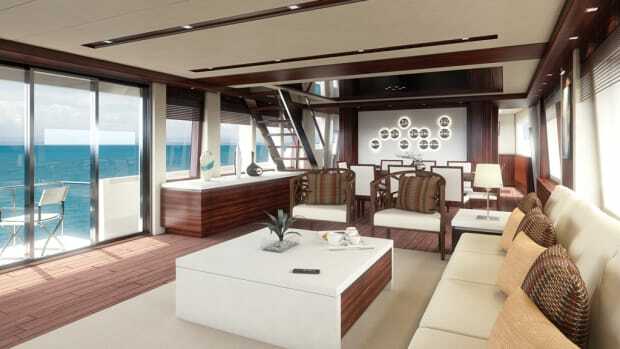 In addition, Hatteras included a coffee and snack bar just outside the master’s doors on hull number one. 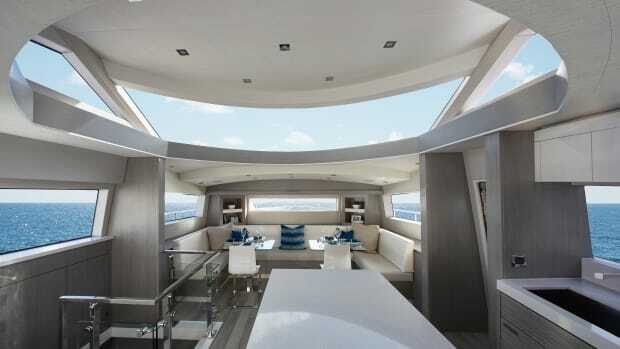 That’s a megayacht touch that makes waking up all the more enjoyable. Crew can set up morning beverages while guests are still sleeping. 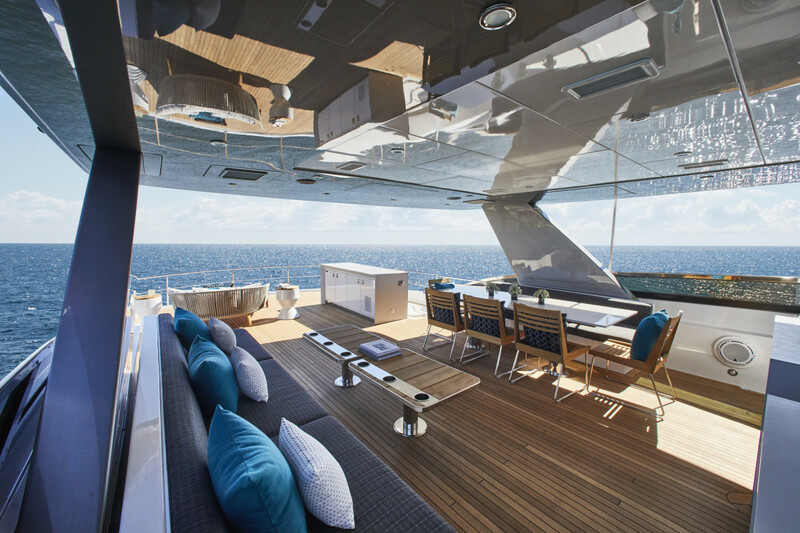 To maximize social space on the Hatteras M90 Panacera, the builder designed the foredeck to include a cozy seating and dining area with a sunpad. 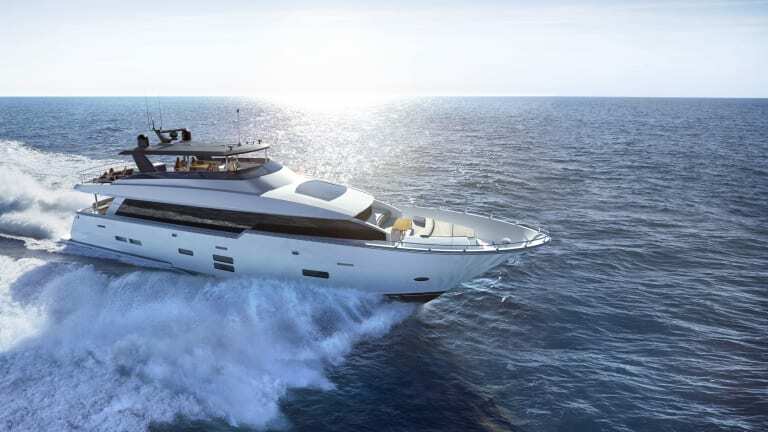 Another feature that lends a sense of big-boat elegance and space is an option that Hatteras fitted aboard hull number one: a balcony off the salon. 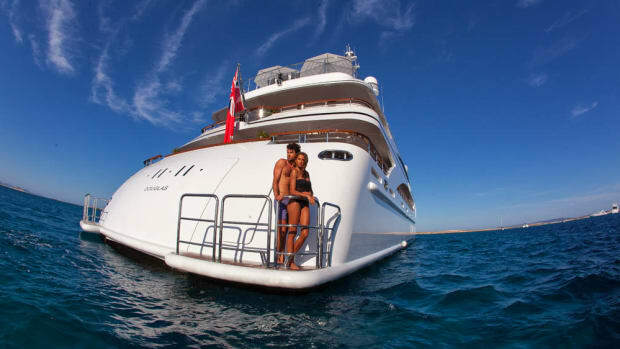 For the past several years, balconies have become must-haves aboard megayachts in excess of 100 feet, as with hot tubs and beach clubs. The balconies bring the outside environment inside, and maximize usable space. 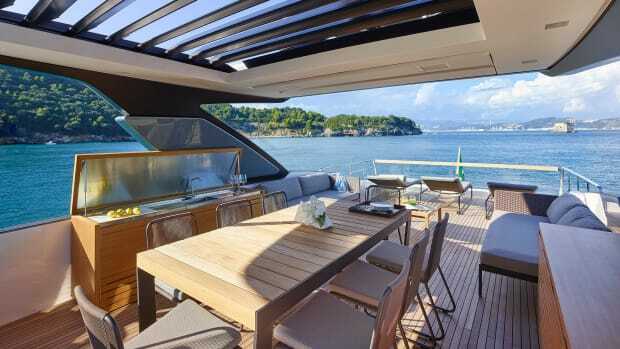 Folding down off the port side, the M90’s balcony is ideally suited to two guests standing and admiring the view, versus setting up a table and chairs. Regardless, the feature is an unexpected touch on a yacht in this class. The same effect happens in the salon, thanks to the sliding side-deck doors and optional balcony. A standard feature aboard the M90 is the proprietary HattCON system, integrating data for navigation, communication, ship’s systems and creature comforts into three touchscreen helm displays. Hatteras’s research and development team collaborated with a German marine-engineering company to avoid the incompatibility issues common to multiple installations. Captains can call up whatever information is needed on each screen: aft camera views for docking, tank levels and more. Where the camera is concerned, a finger swipe adjusts the video display, similar to using an iPad. As for creature comforts, the captain can control lighting inside or outside, including underwater lights. 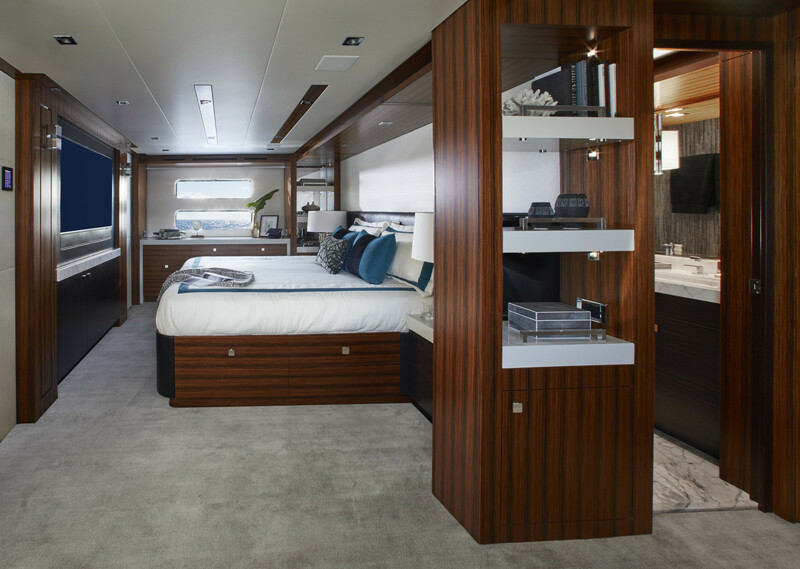 The full-beam master stateroom is belowdecks with large hullside windows. HattCON includes a more traditional in-dash helm display, too, for times when seas might be too rough for touchscreen operations. The system also has two 10-inch displays for the galley and crew’s quarters. Owners and guests get fingertip control over lighting and air conditioning via wall-mountable, auto-dimming displays in common areas and staterooms. Moods can be preset for different times of day, with iPad control of music and movies. On the top deck, guests can decide between sun or shade. 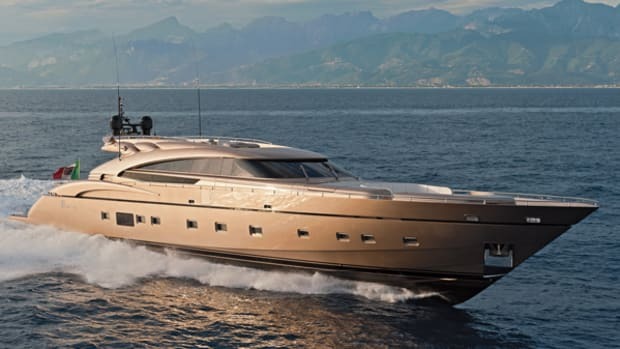 With a cruise speed of 17 to 19 knots and a top speed of 21 to 23 knots with the standard 1,600-horsepower Caterpillar C32As, the M90 Panacera fits nicely among semi-displacement, entry-level superyachts. At the same time, though, she dares to do a few things differently. Buyers and the competition are both likely to sit up and take notice.